AVAILABLE FOR PURCHASE IN STORE OR BY PHONE OR EMAIL. This yarn is only available to buy in person, from our shop. It cannot be ordered from our online shop. Pictures and listed colours are for reference only; we will do our best to only list colours that are currently available. Stock levels are shown here, but contact us if you are interested in this product. Colours found in the drop-down list above are currently available in store. 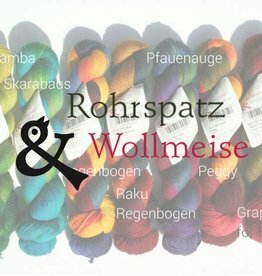 Wollmeisen Rolls are knit blanks that you can start knitting immediately and for the first time achieve very long colour gradients with intense Wollmeise colors. Each Wollmeisen Roll is 150 grams, same as a complete skein of Pure. For pattern suggestions, check out Baaad Anna’s favourites bundle on Ravelry.